More new photos of the birch bark canoe building project, now under way at the Penobscot Marine Museum in Searsport, Maine, have been posted on Picasa. Some classic wood/canvas canoes on display at Penobscot Marine Museum. The first three shots are a Morris with extraordinarily shaped recurved stems. Numbers 4 and 5 are an Old Town sponson canoe (sorry, don't know the exact model) named Susannah, hanging upside down and soon to be part of a new exhibit called Rowboats and Rusticators. Interesting thing about sponson canoes: the sponsons were applied after the rest of the canoe was built, and the sponsons themselves were built much like boats in their own right, with planking laid over station frames. A new birchbark canoe of Penobscot Indian design is under construction at Penobscot Marine Museum in Searsport, Maine, under direction of Master builder Steve Cayard. I've posted a bunch of photos of the construction in process here, as well as a few shots of an extraordinarily beautiful canoe that Steve recently completed, shown above. Anyone in the Midcoast Maine area is strongly advised to come to the museum this week or next to observe. This is a true master at work on one of the world's finest indigenous boat types. Master builder Steve Cayard is building a bark canoe on the grounds of Penobscot Marine Museum in Searsport, Maine, this week. (The photo isn't of Cayard -- it's a member of his building team.) More photos here, including a few of one of Steve's finished boats -- a glorious work of art the likes of which I've never seen. An article in the June '09 issue of National Geographic features an early-ninth-century dhow wreck that was discovered off Sumatra, Indonesia. Loaded with Chinese trade goods, the wreck provided archaeologists with much detail about the nature of trade between China and the Persian Gulf, and about the boats that engaged in it. About 58 feet long and 21 feet in beam, the hull was sewn, not nailed or pegged. Sewing was probably coir (fiber from coconut husks), and caulking with paperbark wadding. Planking was hardwood -- possibly teak -- and the deck was bamboo. 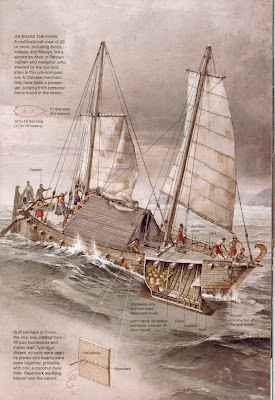 According to the typically illuminating NG-style illustration, it had a straight keel, straight stem and sternpost (like a boom), and a steering oar a la a Viking ship. It had a keelson, deck beams that extended through the hull planking, and used lead ingots for ballast. The most un-dhow-like feature, by modern standards, were the lug sails, as opposed to settees. It's thought that it may have been built in Oman -- a major dhow-building center right into the 20th century. The reconstruction is similar to an Omani type "known as a baitl qarib", according to the article. The book The Dhow, by Clifford Hawkins, which I've referred to in recent posts, doesn't describe this type. A full-scale, sailing reproduction of the ancient boat, named the Jewel of Muscat, is under construction in Oman, with launching planned later this year. More on that project here. Thanks to Oman Holidays for the comment on my previous post drawing my attention to this impressive, ambitious project.